Whether you are taking your family on a trip to the South Rim of the Grand Canyon for a summer vacation or picking up a souvenir after a Grand Canyon rafting adventure, there are interesting, educational and engaging Grand Canyon themed books for children. Here are three of the best Grand Canyon kids books for children in preschool and elementary school. The Adventures of Salt and Soap at Grand Canyon. Salt and Soap are two little pups who have an adventure of a lifetime after hiking a trail leading into the Grand Canyon. Their adventure continues as they end up on a rafting trip traveling on the Colorado River. The river trip stops at a ranger station at Phantom Ranch where the pups then spend a week exploring the area. They eventually hitch a ride out of the Canyon by helicopter and are dropped off at the South Rim of the Canyon. One of the rangers from Phantom Ranch adopts the pups and they become permanent residents of Grand Canyon National Park. 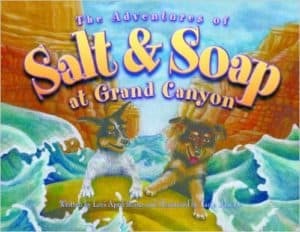 The Adventures of Salt and Soap at Grand Canyon is based off true events. You can watch a presentation by the author on YouTube. The clip includes history about the Grand Canyon and about how her book came to fruition. The three part presentation includes great information about the Grand Canyon, photos of the real Salt and Soap and a reading of the story. This story is a personal favorite of many river guides when it comes to Grand Canyon Kids Books! Written by Lori Rome and illustrated by Tanja Bauerle. This is a heartfelt story about sharing the love of outdoor adventure with family. It begins with a young boy who visits the Grand Canyon with his grandmother. She sews him a hat to wear on their trip. His new lucky hat makes him feel safe and brave. He dreams about hiking in the Canyon someday. A few years later as a teenager, he hikes in the Grand Canyon. His lucky hat blows off his head and is lost. 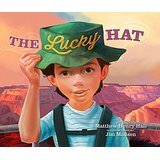 He returns to the Grand Canyon year after year to search for his lucky hat. He meets lifelong companions and encountering beautiful nature along his journey. At the end, the boy has grown into a man. He sees that he had found what he was looking for a long time ago. He realizes that sometimes when we lose something we cherish, we find something else we cherish even more. Written by Matthew Henry Hall and illustrated by Jim Madsen. 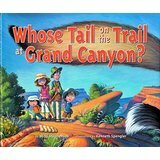 Whose Tail on the Trail at Grand Canyon is a cute book! It is about the animals a visitor may encounter on a visit to the Grand Canyon. A family begins a hike along the rim overlooking the gigantic Grand Canyon. They encounter many familiar tails along the trail such as desert cottontail and mule deer. As the family descends into the Canyon, they happen upon more tails on the trail. The author incorporates many recognizable Grand Canyon sites within the illustrations. You will see the Kolb Studio, Bright Angel Trail, Colorado River, river rafters and Phantom Ranch. The front and the back of the book is papered with Grand Canyon animal footprints that are identified for the reader’s enjoyment. Written by Midji Stephenson and illustrated by Kenneth Spengler. Grand Canyon kids books may be available at your local library or the Grand Canyon National Park visitor center. You can find these books online through various vendors. To purchase online, please consider supporting regional vendors. Find The Adventures of Salt and Soap at Grand Canyon at Arizona Raft Adventures (www.azraft.com) or The Lucky Hat and Whose Tail on the Trail at Grand Canyon from the Grand Canyon Association (www.grandcanyon.org).